The arts and music festival has been held on his Somerset farm since 1970. "After 41 years, to win something of this magnitude is something to be incredibly proud of," said the 76-year-old. Eavis was made a CBE in the Queen's 2007 birthday honours list. Michael Eavis gave up an early career in the merchant navy to take over the family farm in 1958. Inspired by the Bath Festival of Blues in 1969, he hosted a small event the following year at Worthy Farm which, in the subsequent five decades, has become one of the biggest arts events in the global calendar. "Glastonbury is the grandfather of the incredible festival market which Europe enjoys," said James Drury, managing director of the Festival Awards. 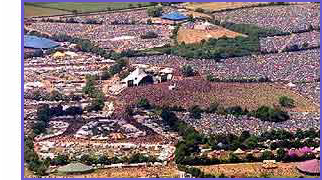 "Michael is cited as an inspiration by almost every festival organiser I speak to across the world. This is why he is so deserving of this honour." This year's festival saw Coldplay, U2 and Beyonce headline Glastonbury's famous Pyramid stage. Next year is a "fallow year" which will allow Worthy Farm to recover from the strains of hosting 170,000 people in June. Eavis will receive his honour at ceremony in Groningen, The Netherlands, on 11 January.